As I head down to Los Angeles tomorrow for my 10 year high school reunion (yikes!) I am gutted to miss two more local San Francisco shows. 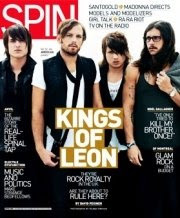 Overseas sensation Kings of Leon will be playing at the Warfield on Friday, October 17th and Saturday, 18th. We Are Scientists and The Stills will be opening. Man, what a fantastic show. Understandably, it looks like these two Leon shows are sold out. Spin Magazine wrote a great article about the Kings and their tumultuous relationship as brothers (and one cousin) and their struggle in being one of the biggest bands overseas while still being virtually unknown here in their own country. They headlined the Glastonbury Festival in England and are very popular among folks I was talking to in Australia, including my aunt. Even though they are selling out two nights at the Warfield, you can't usually judge the national popularity of a band by a Bay Area hipster turnout. After listening to their album a few times, I'm totally jumping on the bandwagon that got going years ago. Once you get past their glam rocker prettiness (Jonas Brothers much? ), they're pretty awesome. Here's a bit of "Use Somebody." Also, Los Angeles based band Dengue Fever will be playing a show at Bimbo's 365 Club (my favorite venue in the area might I add, it's so Ratpack!) on Friday, October 17th at 9pm. Throwback San Francisco soul band Lord Loves a Working Man will open. Tickets are $16. This show is NOT sold out. I've now missed Dengue fever two or three times, and I'm sorta pissed about it, especially considering I think I've been in LA when they've been San Francisco, but that's the way it goes. Dengue Fever is especially interesting to me because of Cambodian born vocalist Chhom Nimol. Most of her lyrics are in the Cambodian language, although she does in some instances sing in English. Dengue Fever has consistently retained a Southeast Asian pop music feel in the guitars and rhythms. Chhom's moves are also based on traditional Cambodian dance. When Chhom lived in Cambodia she performed for the King and Queen. When Dengue Fever toured Cambodia in 2005, it was the first time since 1975 any band had performed music like this kind. The documentary Sleepwalking Through the Mekong was made about this experience. Lord Loves a Working Man brings the house down as well. Bring your dancin' shoes! Here's a video of Dengue Fever's "Sni Bong"
I added some Kings of Leon and Dengue Fever tunes to my playlist over on the right there. And on that note, anyone in the area feeling crazy enough to see Tina Tuner with me next week? It's expensive, but man, it'll probably be worth it. I know, I can't stop listening to the new album! It gets better and better every time.